Cumberland Hospital staff enjoy a tour of the east campus, including the archaeological dig site. Cumberland Hospital staff got a glimpse of the past, as well as a vision for the future on May 26, as they enjoyed an open day at the hospital to help mark National Archaeology Week (May 21 – 27). UrbanGrowth NSW’s Parramatta North Urban Transformation project team hosted guided tours of locations across the site, including the recreation hall, sports oval and pavilion, the home of the beloved grey-headed flying fox colony, as well as the repair works currently underway to the heritage buildings. Urban Growth NSW’s archaeological team Casey Peterson, Phil Boney, Susan Whitby and Jamie Eastwood. 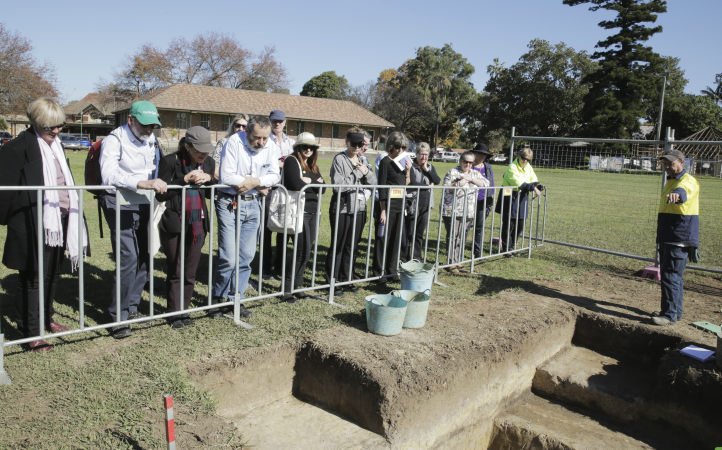 UrbanGrowth NSW Western Sydney projects head Matthew Beggs said the open day was an ideal opportunity for staff to learn about the site’s past and exciting future. “They got the chance to see for themselves what happens on an archaeological dig site, and learn more about the precinct’s rich Aboriginal and colonial heritage. Staff were given a glimpse of the work before they will be revealed to the general public on May 27. “Every day we are learning more about the site’s rich heritage and history and gathering ideas about how this can be remembered, interpreted and cherished,” Mr Beggs said. The NSW Government is working to renew about 30 hectares of land at Parramatta North, including the Cumberland Hospital (East Campus) and the former Norma Parker Periodic Detention Centre. Repairs to heritage buildings to ensure they are safe, secure and weatherproof – including works to repair roofs, chimneys, windows, verandahs and other structures. Repairs to the heritage palisade fence along Fleet Street. Archaeological invsetigations to better understand the site’s Aboriginal and European history. All findings will be documented and reported to the NSW Heritage Council & the Office of Environment & Heritage. Archaeological investigations will continue until mid-2017, while current heritage building repairs will continue until early 2018.